Remember the panic back in 2009? All the banks were going to fail, right? Remember we reported that "Tarp was working?" Big U.S. banks plan to increase dividend payouts and share buybacks to their highest levels in years after the Federal Reserve on Wednesday approved capital plans for all 34 firms taking part in its annual stress tests. The paybacks announced by banks following the tests’ release Wednesday were in many cases *above* what investors had expected. Because of the great recession and potential financial meltdown, the stress tests were put in place. With the tests in mind banks develop risk-management systems each year to meet the Fed’s test expectations. This year’s passing grades suggest that those efforts have paid off. Banks today are better capitalized and more conservatively managed than in the years before the financial crisis and have better insight into risks lurking in their own books. So bottom line, TARP did work. Just 3,398 people were looking for work in Boulder County Colorado in April 2o17, giving it the lowest urban unemployment rate in the country -- a skinny 1.8 percent. While many would consider this great news, it's giving employers, who have thousands of jobs to fill, heartburn. "We keep thinking it's hit rock bottom," said Angela Spinelli, director of talent acquisition for UCHealth. "but it keeps going lower. We're all trying to figure out how to get out in front of it." UCHealth is trying to fill 200 jobs at its new Longs Peak Hospital in Longmont. The competition for talent is so fierce that the minute a viable candidate pops into view, recruiters rush to bring them in for an interview. "When the market crashed (during the Great Recession), you could find a candidate and interview them three weeks later. Now you have to do it within the week because they are being interviewed by multiple companies," she said. Even economists have entered the how-low-can-it-go sweepstakes debate that is front and center in the region. "It's never been lower here than it's been in March and April," said Brian Lewandowski, an economist with CU's Leeds School of Business. "These are historic lows." Modern records on the region's unemployment date back a quarter century, to 1990. According to this data, the only time Boulder County's unemployment rate was lower was for a brief time in 2000, when it hit 2 percent right before the tech bubble burst, Lewandowski said. It came close again in 2007, right before the financial crash, when it hit 2.8 percent. Unemployment rate numbers, like other economic indicators, are revised as data is checked and analyzed post-collection. These latest numbers are not seasonally adjusted, and when they are they may move upward, according to Ryan Gedney, senior economist at the Colorado Department of Labor. "I would imagine if Boulder isn't the lowest, it will be pretty darned close when the revisions are done in a couple of months," he said. Out on the street, companies are scrambling to find new ways to recruit workers and to keep those they've recently hired, on the job. The University of Colorado Leeds School of Business has 900 graduates to place this summer. For the past several years the school has enjoyed a placement rate of 90 percent plus. Thanks to the shortage of workers, average salaries have risen 3.5 percent, according to Katie Connor, director of career development for the school. New grads, on average, command salaries of $53,000. "The economy has been very good to us," Connor said, "and it's providing great opportunities for our students." But the Leeds School is seeing employers arriving on its doorstep earlier and earlier in the education process. "Employers have had to step up their game," Connor said. "They want freshman to know who they are so they can attract those top students for internships in their sophomore and junior years and then hire them. Employers are on campus a lot more often." Charles Schwab is one of those employers who shows up early and stays late at the Leeds School. It has 400 openings at its Colorado operations center in Lonetree, south of Denver, according to Brian McDonald, who oversees the company's retail, stock plan, and stock compliance services. "The war for talent is not lost on us," McDonald said. "Financial services wasn't and still isn't the most popular industry when it comes to hiring, especially when you think about the 2008 and 2009 financial crisis. "We're finding that if you want top talent, you have to start in the career trajectory earlier. We did not have to do that 10 years ago." McDonald said his company is able to fill most of its entry level jobs, but it has had to accelerate the pace at which it bumps salaries for those new hires because otherwise they loose them to other firms quickly. "To retain talent is just as hard as to attract it. We have to stay incredibly competitive," he said. UCHealth is also shifting its hiring stance, Spinelli said. "We find that we have to go out-of-state more often for our niche positions, and we would rather hire locally." In response UCHealth has begun developing internal programs to train its own workers for some of its most demanding jobs. "We're doing a lot of "grow-your-own" programs to develop our work force," she said. Despite living with a chronically tight labor market and an overheated economy, no one is predicting crashes like those that occurred after the dot.com bust in 2001 and the housing collapse seven years later in 2008. Of course they're are not ruling them out entirely either, given the political uncertainty at home and abroad. The economic expansion underway is 93 months old, according to Gedney, of the Colorado Department of Labor and Employment. That's younger than the 120-month expansion in the 1990s, he said. Still the lack of workers is starting to slow the economy here and nationwide, he said. "The problem with low unemployment is that there are job openings and no one to fill them. This could cause businesses to say 'we can't find workers so let's figure out how to streamline things. It's natural for growth to slow," he said. There is some comfort, however, for employers who are wringing their hands over unfilled jobs. Things could always be worse. And for those looking for work -- guess what? -- this is just about as good as it gets. When Obama assumed office, the unemployment rate was still rising sharply. It topped out at 10 percent in October 2009, hovering just below that level for the next year, before beginning a steady decline at the end of 2010 that has persisted into early-2016 and breaking through the 5 percent mark at the beginning of 2016. The government, delivering the last major snapshot of the economy before Election Day 2016, reported on Friday that employers added 161,000 workers in October, a performance that suggested a healthy outlook for the months ahead. The official unemployment rate dropped to 4.9 percent, from 5 percent. And average hourly earnings rose 2.8 percent year over year, a level not reached since 2008. Does anyone out there remember what the economy was like when Obama took office?! Many have tried to dilute all the incrediblely improving US economy jobs numbers -- which now show gains of nearly 13,500,000 new private sector jobs since the great recession. Additionally folks have tried hard to discount the unemployment rate now hovering near 5 percent. The only remaining negative mantra continues to be "Declining Labor Participation Rates." The "logic" goes something like this: even though the unemployment rate is at 5%, the reason is because many people in the jobs market have "given up hope" and stopped looking for work. Although you can always find examples of folks who have given up looking, the broad statement does not prove out in the general population. In fact, the main reason today that folks have stopped looking for work: THEY FEEL SECURE ENOUGH TO RETIRE! So no matter who is president or who controls the congress -- and independent of the health of the economy -- the BLS projected in 2006 that labor force participation rates were going to go down. Further another report from Shigeru Fujita at the Federal Reserve Bank of Philadelphia on Feb. 6, 2014, teases out the relative impact of various causes for the declining labor force participation rate. However, Fujita concluded, “Almost all of the decline (80 percent) in the participation rate since the first quarter of 2012 is accounted for by the increase in nonparticipation due to retirement. This implies that the decline in the unemployment rate since 2012 is not due to more discouraged workers dropping out of the labor force." (See page two of the report linked above). So in fact what has occurred is two-fold... job creation is constant and retirement conditions have improved! Fujita further concludes: "The significant rise in retirement in the past three years is clearly related to the retirement of baby boomers. Remember that the first cohort of baby boomers was born in 1946. Importantly, this wave of retirements could have started earlier than three years ago. However, a plausible conjecture is that the 2008 financial crisis and associated loss of wealth might have had the effect of delaying their retirement age, while the subsequent recovery of financial wealth has allowed more of them to retire in the past few years." US Economy Adds 271,000 Jobs in October; Unemployment Rate Now at 5 Percent! U.S. employers went on a hiring spree in October, according to government data released Friday morning, adding 271,000 jobs. The number was far above analysts’ consensus of about 185,000 positions. The unemployment rate fell to 5 percent, and wages rose at the fastest pace since 2009. The robust data provides more evidence that the job market is nearing a full recovery six years after the recession officially ended. The jobless rate peaked at 10 percent in 2009 and is now closing in on what many economists believe to be its lowest sustainable level. October's jobs increased across a broad swath of industry segments. Administrative and support services added 46,000 workers, and the health care industry added a similar number. Retailers and restaurants added more than 40,000 positions each, while construction employment increased by 31,000. “At this point, I see the U.S. economy as performing well,” said Fed Chair Janet Yellen on Wednesday during her testimony at the US Capitol. Remember what we said back in 2008? It's not so bleak after all! The job market continues to get better: After 59 straight months of job gains, this shouldn’t be a controversial statement. And job growth has been impressive: The U.S. economy is now adding jobs at a pace of about 3 million per year. The unemployment rate is the lowest it has been since April 2008 and broader measures of underemployment are improving as well. The U.S. economy added 173,000 jobs in August, pretty much in line with recent trends of about 200K per month. The unemployment rate fell to 5.1 percent, again a drop that was pretty much in line with recent trends. The rest of the monthly report from the Bureau of Labor Statistics was similar: positive. And as we've seen before, the jobs gains are not just quantity, but quality. As we all know prior conversations in the media discussed research that suggested that college graduates were stuck filling low-wage jobs. GU's latest report, Good Jobs Are Back: College Graduates Are First in Line, analyzes the growth of the U.S. jobs and wages during the recession and recovery, and shows this earlier research to be misleading. They find that since 2010, the economy has produced 6.6 million employment opportunities, 2.9 million of which are considered good jobs (a term they use for jobs in the upper-third by median wages of occupations in which they are classified). The key findings of the report reveal that 2.8 million of these good jobs went to college graduates. Some of the largest growing professions seek highly-skilled workers and offer large benefit packages. Most good jobs are full time and twice as likely to provide health insurance and retirement plans. Read the full report here to learn more about the growth of good jobs during the recovery. If you don't have time to read the full report, here is the bottom line: "The Great Recession was a major hit to the U.S. labor market, and the slow pace of economic recovery has left many people apprehensive about embracing any positive news on the jobs front. The prevailing narrative in the early months of the recovery described young people graduating from college and being unable to find positions in their fields of study. They sometimes settled for low-paying, part-time jobs, often in retail and food services industries, because such positions were all they could find. But that is just a small part of the story. The larger picture shows that as the recovery accelerated, more high-quality, good jobs were created, and for the most part, they were filled by highly-skilled professionals with postsecondary education. A more accurate description of the common experience in this jobs recovery is of college graduates finding good jobs with benefits." The US economy continues to add jobs... The US economy added 215,000 jobs in July, while the unemployment rate remained steady at 5.3%, meeting expectations. So far this year, job gains have averaged 208,000 a month. That's about 1.5 million new jobs this year thus far. “...yet another solid employment report”, said Chris Williamson, chief economist at Markit. Additionally last week, applications for unemployment benefits increased by a meager 3,000 to about 270,000. The four-week average dropped to 268,250, close to such low levels not seen for nearly 15 years. This additional report of an increase of more than 200,000 jobs implies a continued downtrend in unemployment, according to Jim O’Sullivan, chief US economist at High Frequency Economics. Such a downtrend would reinforce the Fed’s assessment of the jobs market and recent employment gains as “solid” and get the unemployment rate to within the 5% to 5.2% range that most Fed officials consider to be consistent with "full employment." Gross domestic product soared 5% on an annual basis in the third quarter -- that according to the US government report on GDP this week. It was icing on the cake for an economy that is now humming along. To put that in perspective, it is the strongest quarter of growth since 2003. That's right: the best quarterly growth in 11 years! "...There is no doubt the economy has been great this year," said Dan Greenhaus, chief global strategist at BTIG LLC. Others on Wall Street agree and continue to send the stock market to record highs with the Dow index now crossing 18,000 for the first time ever. Growth came from all major segments with business investment, consumer spending, housing, exports and government spending all showing signs of robust strength in this week's report. All of those healthy reports explain why hiring has increased dramatically this year. Employers added 321,000 jobs in November, making 2014 the strongest year for job growth since 1999. Again -- underscore this and make no mistake: this year has been the best year for job growth in 15 years! Finally...for the first time in seven years, more than half of Americans think the economy is in good shape, according to a new CNN/ORC poll released on Tuesday. That marks a big improvement from October when just 38% of Americans said economic conditions were somewhat or very good. The U.S. economy grew at a very solid annual rate of 3.5 percent in the July-September quarter, propelled by solid gains in business investment, export sales and the biggest jump in military spending in five years. The Commerce Department says that the third quarter result followed a 4.6 percent rebound in the second quarter of 2014. 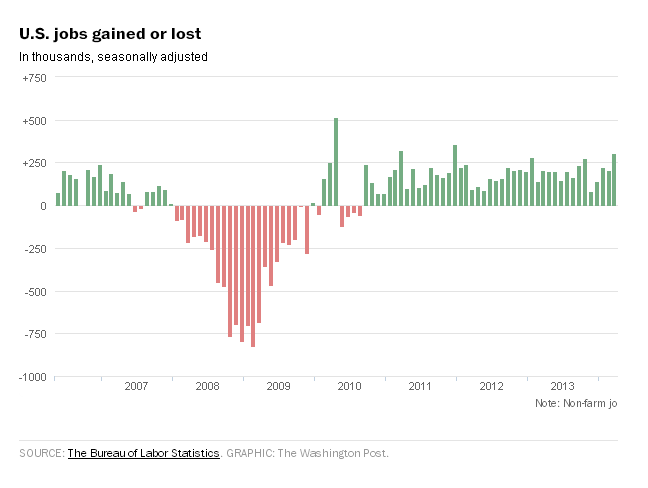 § All job losses during the great recession have been erased. § In June the economy added 200,000+ jobs for the fifth month in a row -- 288,000 in June alone. The five month streak is the longest since the late 1990s. § The Unemployment rate is now at 6.1% -- you may remember that the unemployment rate was at 10.1% at the height of the great recession. § Corporate profits and stock prices continue to set record highs. § The number of food-stamp recipients has retreated from the record high of 2012; fewer beneficiaries have been added under Obama than were added under George W. Bush. § Under Obama, federal spending has risen more slowly than the rate of inflation. § Auto sales -- a consistently bright spot in the recovery -- heated up even more in June. They clocked in at 17 million at an annualized rate for the best month in eight years. § Gallup polling found that 45 percent of Americans were working full-time in June, one of the highest rates since the polling company began tracking the figure. § The government data released Thursday mirrored those results, with the employment-to-population ratio rising to 59 percent, the highest level since 2009. The United States lost 8.7 million jobs in the aftermath of the financial crisis. As of November, it had gained about 7.4 million of those jobs back. Real GDP growth for the second quarter was raised to an annualized rate of 2.5 percent compared to the initial estimate of 1.7 percent and compared to a fourth quarter rise of 1.1 percent. Expectations were for 2.2 percent. The upward revision to GDP growth was mainly due to a sharp upward revision to net exports. Also, there were improvements to inventories and nonresidential structures investment. Comparisons to the first quarter of the year showed that the increase in real GDP in the second quarter primarily reflected positive contributions from personal consumption expenditures, exports, private inventory investment, nonresidential fixed investment, and residential fixed investment that were partly offset by a negative contribution from federal government spending. Imports, which are a subtraction in the calculation of GDP, increased. Headline inflation rates when annualized remain quite tame. Manufacturing momentum is accelerating again. While civilian aircraft added huge lift to December durable goods orders, the gains were broad based. New factory orders for durable goods in December jumped a whopping monthly 4.6 percent, following a boost of 0.7 percent in November. The market forecast was for only a 1.6 percent increase. The transportation component on the index spiked 11.9 percent. Excluding transportation, durable goods orders increased 1.3 percent, following a rise of 1.2 percent in November. The consensus called for a 0.4 percent rise in orders excluding transportation. Outside of transportation, the index increases were led by primarily metals, up 3.6 percent, and computers & electronics, up 3.3 percent. Also rising were fabricated metals and machinery. Initial unemployment claims in the January 12 week plunged 37,000 to 335,000 for a recovery low and massively below anybody's expectations. The consensus predicted for the week had been 368,000. There are no unusual factors skewing the latest data although some seasonal adjustments may play a role. The four-week average is down 6,750 to 359,250 which is about 10,000 below the mid-December level. Improvement continues in the jobs market, and this report continues to point to a longer term trend leading to more robust jobs growth this year. Today’s report from the Bureau of Labor Statistics (BLS) shows that private sector businesses added 168,000 jobs in December. Total non-farm payroll employment rose by 155,000 jobs last month. The economy has now added private sector jobs for 34 straight months, and a total of 5.8 million jobs have been added over that period, taking account of the preliminary benchmark revision. In 2012, private businesses added two million payroll jobs, taking account of the preliminary benchmark revision. The US stock market rallied on Wednesday - the first day of the trading new year. Gains were broad. Financial shares and tech stocks fared exceptionally well. The US rally followed a broad world stock surge that begin as lawmakers finalized voting late Tuesday evening in Washington DC. Investors were cheering that late year deal which keeps tax cuts in place for most Americans but raises the tax rate on individuals earning more than $400,000 a year and married couples earning over $450,000 a year. Lawmakers in DC also extended federal emergency unemployment insurance benefits for another year as the jobs marketing continues to improve. For its final estimate for the third quarter, GDP got a notable upgrade. Real GDP growth for the third quarter was revised up to 3.1 percent annualized, compared to the second estimate of 2.7 percent annualized and to the advance estimate of 2.0 percent. The latest number easily topped market expectations for a 2.8 percent advance. Demand figures also got a boost. Final sales of domestic product increased 2.4 percent versus the second estimate of 1.9 percent and second quarter growth of 1.7 percent. Final sales to domestic producers (which exclude net exports) were revised to 1.9 percent, compared to the second estimate of 1.7 percent and compared the prior quarter's 1.4 percent. The U.S. economy added 146,000 jobs in November, and the unemployment rate fell to 7.7% from 7.9% in October, the Labor Department said. That's the lowest unemployment rate since December 2008. "Our analysis suggests that Hurricane Sandy did not substantively impact the national employment and unemployment estimates for November," the Labor Department said in a press release. Stocks have lots of room to run, said Goldman Sachs senior investment strategist Abby Joseph Cohen at the Bloomberg Hedge Fund conference in New York Wednesday morning. Cohen, a 22 year veteran of Goldman Sachs, estimates that even after the 2012 market rally, stocks could rise another 10% to 15% in 2013. While Congress has given the U.S. population reason to worry about taxes and the fiscal cliff, the overall fundamentals of the U.S. economy are healthy, and consumers have money to spend, Cohen said. Moreover, the U.S. has been reducing its debt relative to its growth domestic product during the past few years. She noted that debt was 4% of GDP for the fiscal year that started in October compared to an 11% ratio in 2008. "We are slowly growing our way out of the most extreme version of the debt crisis," she said. "Invisibility Wetsuits" for protection against shark attack while you swim. Hi, this is WhatsApp. Who’s this? ThinkRecovery.org - Save Our Economy! Rocky Mountain Bathrooms -- bathroom remodeling denver-- we fix ugly bathrooms! What Does This Song Mean To Me? And You? Better trades does not invest your money for you but it teaches you how to do it yourself. To learn more about better trades schedule a free workshop now. Receive a payday loan from DollarsDirect and feel relieved that your cash advance will cover your bills on time. Low Low Rates -- Here to Stay?